While Shelby Davidson could not viewed as a prolific inventor, he is significant in that he served as a great example of education, determination and perseverance. Davidson was born in Lexington, Kentucky on May 10, 1868, the son of Shelby Jeames and Amelia Scott Davidson. Having been born after Emancipation, the younger Shelby was able to take advantage of the educational opportunities in the public school system. He later traveled to Louisville and enrolled in a state university program. 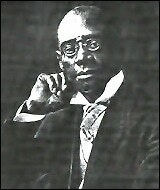 Dissatisfied with the scope and quality of the program, he enrolled in Howard University in 1887. Howard, at the time, was the premier academic institution for Black students. As such, Shelby had to take additional courses for two years in a preparatory program in order to get him up to speed with his colleagues. In 1983, Davidson’s college career was in jeopardy when charges were brought against him alleging that he had violated University rules regarding his involvement with a married woman. He was promptly expelled along with four other students. Davidson was furious as he had not been formally charged, nor had he been afforded the opportunity to defend himself. After almost six years in the University, he was unwilling to accept the decision and decided to fight back. First he argued that the faculty board had taken action against him and did not have the authority to do so. Further, he argued, that the action was invalid because he had not been afforded the opportunity to defend himself. He drafted an appeal which he forwarded to the Howard University trustees. Eventually, a negotiation took place and the matter was resolved and Davidson received a degree from the University in 1896. The tenacity and thoroughness with which he fought back was precursor to how he would pursue his career. The experience also led him in the direction of pursuing law as a career. He was admitted to the Kentucky bar in 1899 and the the District of Columbia bar in 1900. Davidson would soon take a job with the United States Treasury Department with the help of his congressman William C. P. Breckenridge and he was later transfered to the Office of the Auditor for the Post Office department, first as a messenger and then as a Money Order associate Class C. After several promotions he was working in a department where the government was employing adding machines. Without anyone available to fix or maintain them, Shelby was asked to take on these responsibilities in addition to his regular job. His performance in these roles was enough to gain him additional promotions as well as an invitation from the Burroughs Adding Machine Company (the leading manufacturer of adding machines) to attend a training program on adding machine repair at its Detroit facility. Shelby’s familiarity with the machines was such that he decided to add an add-on device, one which managed the roll of paper that tabulated machine’s calculations The device was called a paper-rewind mechanism for adding machines which would automatically neatly and compactly roll up the paper, from a feeder spool to a rewinder spool. The mechanism allowed the paper to be review or for it to be stored. It was attached to the adding machine by a support arm and also contained an alarm system to alert the user when the paper strip had broken or was empty. Davidson patented the device on April 14, 1908. In late 1907 he began his early attempts which resulted in a very cumbersome device that did not come close to the desired result. At this point he contacted Burroughs, hoping to persuade the company to take on solving the problem. After repeatedly being rebuffed by Burroughs, Davidson and Edwin J, Dowling (the chief electrician at the Post Office Division) continued working on the project themselves. Although they made great strides, by 1910 they decided to try to find another company to solve the problem. this time they turned to the Connecticut Computing Machine Company. The company conveyed that it was confident that it could come up with a practice solution. In the meantime Davidson and Dowling continued their work, achieving a breakthrough when they realized that the adding machine were turning on the 9, rather than on the 0 which was required for the money order fee calculation and in May 1910 they developed a working model. At this point, Davidson and Dowling began the process of trying to patent invention and on March 9, 1911, they jointly filed a patent application. In January 1912, the Patent Office suspended processing the application when it received interference complaints from both Burroughs and Connecticut Computing. Burroughs, it seemed, although declining to take on the project for Davidson, decided that it did see it as a viable money-maker and began working on building a prototype, perhaps guided by Davidson’s feedback which he had naively shared during discussions. Connecticut Computing argued that while they had not communicated that they had solved the problem, the company was taken by surprise by Davidson and Dowling’s patent application. The Patent Office Commissioner of Interference would ultimately find that Connecticut Computing had “reduced the invention to practice” before Davidson and Dowling and because Davidson could not produce drawings as evidence of his work he could not prevail in the case over Burroughs. Eventually, Davidson would leave the Post Office Division as a new administration had come in and was not supportive of hi efforts, effectively demoting him. Davidson had been admitted to the D.C. Court of Appeals in 1903 and the United States Supreme Court in 1912 and thus fell back into the practice of law. At the same time, however, he had started a real estate business in 1909, a business that would secure his financial well-being. He also never lost his interest in innovation as he set out to create an early coin counting device. He would eventually develop a working prototype but it is unknown what ended up happening with the device. Shelby Davidson’s contributions were great, not only because of his creativity, but also because he demonstrated the ingenuity could help one gain control over one’s career and therefore status in society. The Inventive Spirit of African Americans: Patented Ingenuity (Patricia Carter Sluby). Black Inventors in the Age of Segregation: Granville T. Woods, Lewis H. Latimer, and Shelby J. Davidson (Rayvon Fouche). Shelby Davidson, Inventor: In His Own Words.